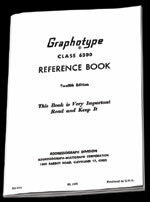 Graphotype 6300 Reference book is the standard operating manual. 5-1/2"x8-1/2". 22 pages, illustrated.